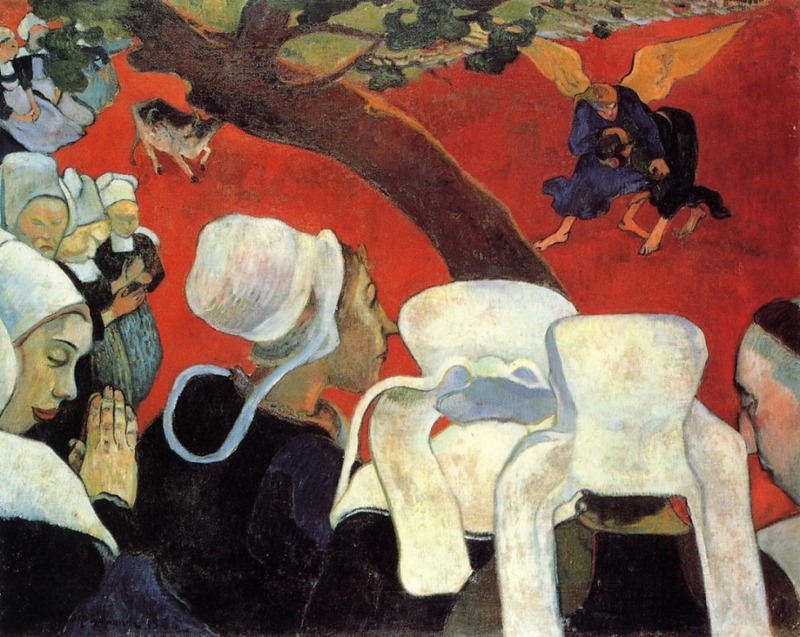 Vision of the Sermon (Jacob Wrestling with the Angel), Paul Gauguin, 1888. These are the words of rebuke that God speaks to Job's friends. This is not a rebuke of incorrect doctrines but of an indifferent attitude toward relationship. It is easy for theologians to speak about God, without ever speaking to God. Last week, we explored the importance of struggling with God, of not turning away when we are in the midst of suffering or doubt but bringing those powerful emotions to God. This week, I have the great pleasure of sharing the insights of my friend Tobias Siegenthaler on the book of Job. As I mentioned last week, Tobias and I had an auspicious first meeting in which dived straight into a theological conversation about the problem of evil in the book of Job. Since then, I have come to know Tobias as a deep, joyful soul who is generous to his core and deeply devoted to Jesus. He is currently pursuing a Phd in Biblical Studies at Saint Andrews University. I would say that Tobias is a gifted speaker, but I think it is more accurate to say he is an excellent preacher. He speaks not merely to inform but to awaken. He preaches, as he studies, in a way that does not merely offers the wisdom of scripture, but opens it as a living and active thing, leading us closer in relationship to God. He has an ability to, as Eugene Peterson would put it, make the words of scripture sing. Tobias certainly made Job sing for me, and I hope this episode will do the same for you! The man himself in his homeland Switzerland. This photo was taken by Kristyn who was on the podcast a few weeks ago. Small world. And I’m blessed with wonderful, interesting friends! If you enjoyed this podcast, sign up to get weekly updates! In last week’s episode, I talked about struggling with God and of course, that most famous God-wrestler came up: Jacob (Genesis 32:22-32)! Tobias sent me this wonderful painting by Gauguin, who, by the way is the one Van Gogh sent his severed ear to! It is called “Vision of the Sermon (Jacob Wrestling with the Angel).” I love how it juxtaposes the pious, contained church goers with the desperate, physical struggle playing out in front of them. Would you rather be the witness or the wrestler? I may end up with a lame leg, but I’d rather be in the ring. I owe several people thanks this week. Tobias, of course, for coming on the show. And I would be remiss if I didn’t thank my amazing sound editor for salvaging the audio on this episode. I brought my mic to Tobias’ house but it decided not to work. But my sound editor took out some of the background sound and made it listenable. I am also deeply thankful for the Anselm Society who sponsor me, have bought me new equipment, and set me up with sound editing to begin with. You all are amazing. And finally, to my generous patrons on Patreon who make it possible for me to continue producing the podcast while doing my Phd. I quite literally couldn’t do it without you all. So, yes. It takes a village to make a podcast! And what a lovely village it is. Did you enjoy this episode? Share it with someone!